This tool is intended to help customers create a quick check estimate (QCE) to compare numbers obtained in their own estimating software. This tool is not intented to replace a users own estimating method or software. If you need help getting started click on the help button located at the top of the tool. Our parts tool makes it easy to generate or find a list of materials needed for a project for ordering or producing submittals. All pricing shown is list price. A multiplier must be obtained and applied from a local wholesaler/distributor for accurate pricing. Note! National pricing is now available. Please make sure you have selected the right country when creating your estimation! Note: This tool is intended for creating a quick check estimate only and may contain minor rounding errors. Pricing should always be obtained from a wholesaler, as Aquatherm does not sell direct. Note: Changing the Labor Factor will reset your custom Tool hours. Labor based on your currently selected parts in the Estimator. Below are the tools necessary for your current estimation. Please note that the numbers are rounded up. For example: You need to rent a 2" hand-held welding iron for 42 hours - slightly over a week. You enter $150 / week for your rental and the result will then show $300 as you need a minimum of 2 weeks to rent the tool to cover the duration of 42 hours. Tip! Registered and logged in users can save the information under company information so it will be there the next time you return to use the Quick-Check Estimate tool. The information below is for who you are providing the bid for. All fields are optional. Note: Saving/Importing projects is only available to logged in users. Got a project code from someone else? You can load their project on your own browser by using this feature! Note: Feature for logged in users only. Note: Export summary of QCE to Excel. To import with part numbers directly, paste the part numbers in Part Numbers box, one per line (no seperators), Quantity in Quantity box, one per line (no seperators). Quantities are assigned on a one to one basis with in the same order as the parts. Parts that do not have a quantity accociated with them will be set to 1. Custom hours were set for one of the tools, by adding a new part all the tools have been reset to properly calculate the total tool cost. Any custom hours for tools will need to be re-entered. The part you tried to add already exist in the Estimator Tool View. If you want to add additional pieces of the same part, please adjust the quantity instead. It seems we couldn't find the part number you entered. Please verify that the part number is correct. Please make sure to enter both Part Number and a valid Quantity. Neither of the fields should be left empty. Your estimation is currrently empty so we can't generate what you're asking for. Add some parts first, then we'll make the magic happen. Are you sure you want to clear your current estimation? To download the submittals for your estimation, click the "Download" button below. Use this to input your current QCE project to an Opportunity in Salesforce. 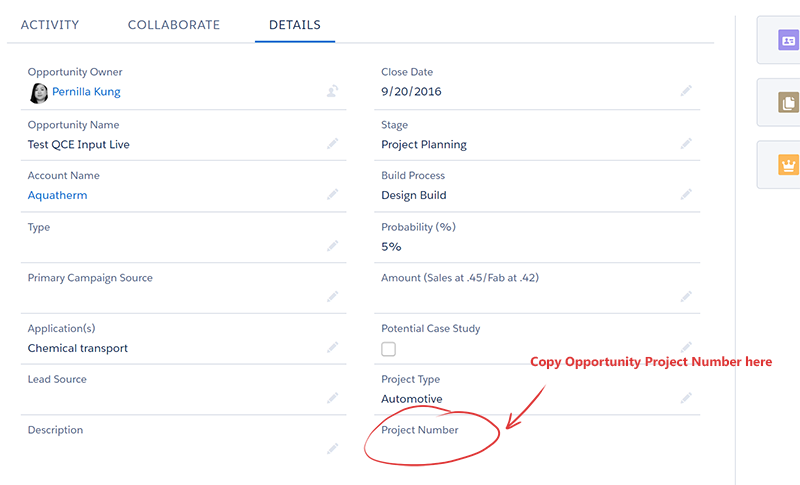 The opportunity must be created in salesforce and have a project number. This will clear all information currently in the QCE project! Leaving the page during the tutorial will delete any preiously saved estimate data. To restore your previously saved data please exit the tutorial clicking the x at the top of the dialog box before refreshing or navigating away. To Import with Part Numbers directly, paste the part numbers in Part Numbers box, Quantity in Quantity box. Quantities are assigned on a one to one basis with in the same order as the parts. Parts that do not have a quantity accociated with them will be set to 1. You're about to load a shared QCE! Loading this QCE project will overwrite your current project. Are you sure you want to clear your current project and replace it with this shared one? Want to share your QCE project with someone? There are several options! Share your project by entering the recipient's email below! They will receive an email with a link to load the entire project in their own browser! Share your project by directly sending them the link to load the project in their own browser! With a project code, they can load the project whenever they want to by inputting the code in the "Load Shared Project" option! Export the current Estimate to as an Excel file. This project will be permanently deleted and cannot be recovered. Are you sure? The value entered was not a valid input for this field. The most commonly used parts have been grouped together in this section to allow for a fast way to select the correct parts you're looking for. Each new row is a new part. Select the Product, Type and Size then hit the " + " button to add the item to your current estimation. Enter notes in the text field below to leave additional details for this specific part. A project with that name already exist! If you wish to overwrite the existing project, click "OK" otherwise click "Cancel" and change the Project Name to something else. A project with that name already exist! Please enter a new name. Please wait while the price list is loading. Bench Style Fusion machines include an iron as part of the assembly. If you add time for a bench style fusion machine, remove time as necessary from both Inlife Fusion Assistance and 4" socket.